Apparently Facebook Inc. wants to be the next LinkedIn. On Wednesday the social media giant announced that business owners who run Facebook pages can now post job openings on them and, just like the company’s better-educated and presumably more sharply dressed rival, invite applicants to apply using their Facebook profiles. The process is similar to posting a status, although job seekers and administrators will see the posts differently. The former will see an icon in their news feeds, on business pages, or under the new “jobs” tab encouraging them to apply, while the latter will be able to review applications and contact applicants on Messenger. 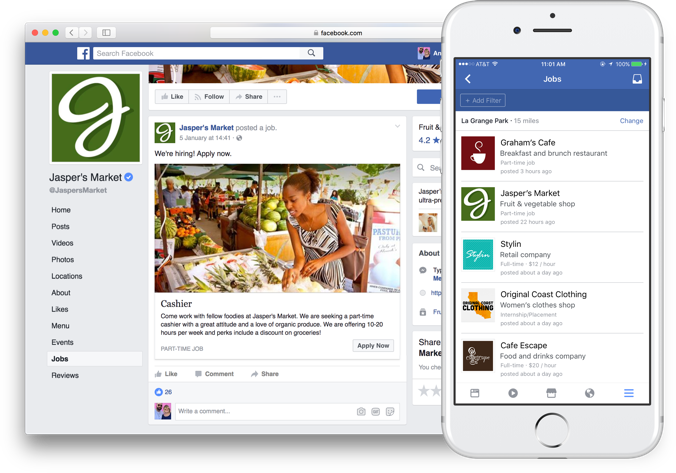 And as with other page-related posts, administrators can pay Facebook to boost posts in order to reach a larger or more relevant audience. Around 1 billion people visit Facebook business pages every month, the company noted. Prior to its Wednesday release the job application feature was tested in several parts of the U.S., and businesses have already begun using it to fill roles, Facebook said. For applicants, clicking on the Apply Now button will open a form pre-loaded with information from their Facebook profile, which they are welcome to review and edit before submitting anything. Users (correctly) worried their posts could jeopardize their chances of getting hired can rest assured that employers will only see public information, a Facebook representative told ITBusiness.ca, no different than if an employer were to search their name publicly. Meanwhile, job seekers looking for work, or business owners wondering what the competition is doing, can browse job postings here, or click the aforementioned jobs tab on desktop or mobile.